We love building thematic units around favorite picture books. 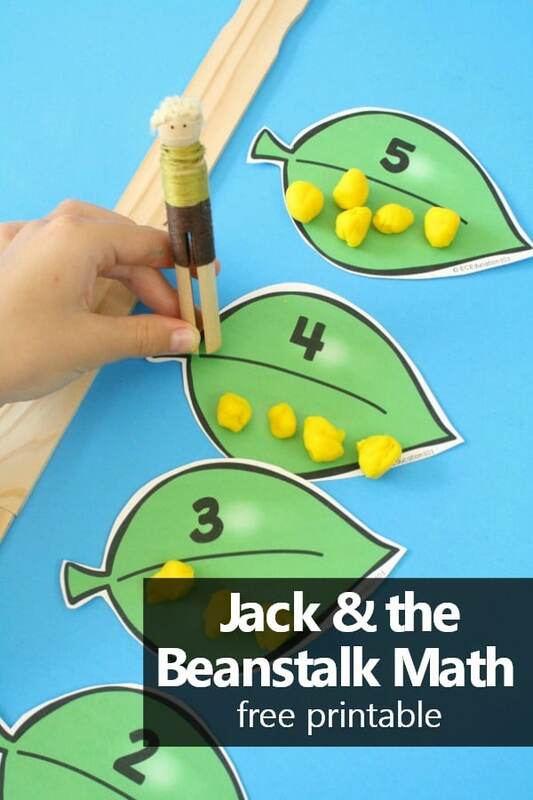 Folk Tales lend themselves to extensive exploration and a wide variety of learning activitites, and we’ve had tons of fun with Jack and the Beanstalk over the years. 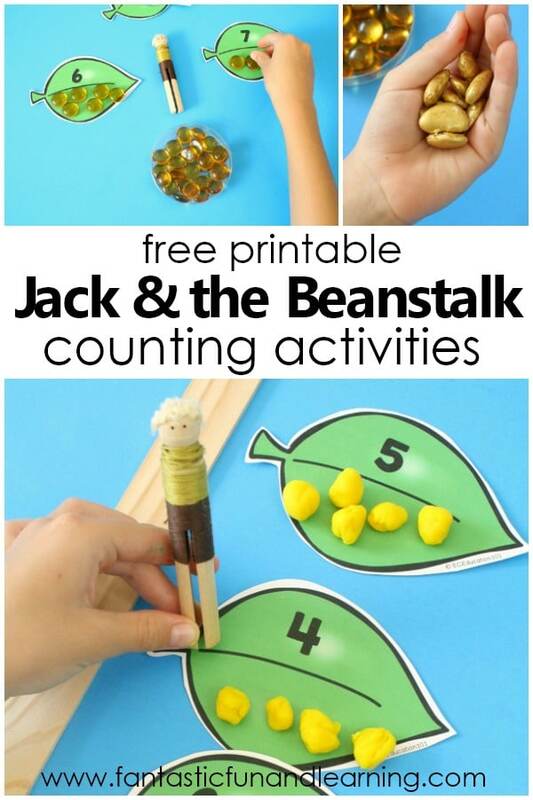 Here we’re using Jack and the Beanstalk as a way to practice counting, creating sets, comparing numbers and more with a free printable Jack and the Beanstalk Math Activity. When I make a printable I like to be able to use it in multiple ways. Not only does this save me prep time, it also gives kids different opportunities to interact with the materials to focus on different concepts. 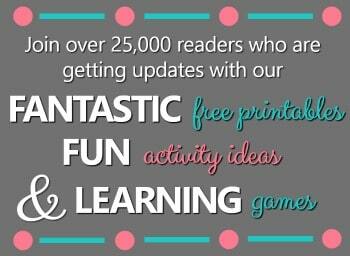 Watch a quick video clip of these activities in action. Then read on for the full details. For this activity I left the leaves out of order in a stack. You can do this as a small group activity or a math center. First kids can order the leaves from smallest to greatest moving up the “beanstalk”. 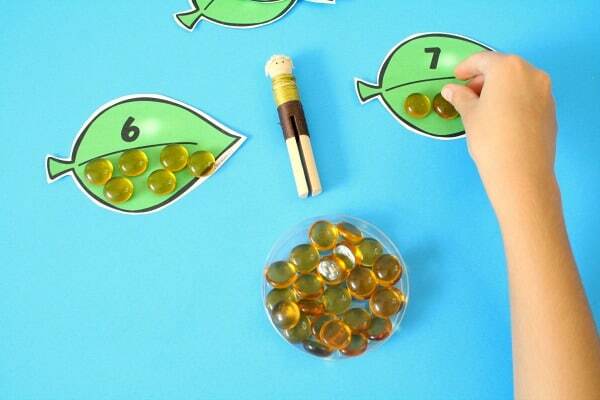 Then give those fine motor muscles a little workout and have them create sets of gold to match the number on each leaf. Finish by having them help Jack climb the beanstalk and count as they go. If Jack moves up two, where will he land? If Jacke moves down one, where will he land? 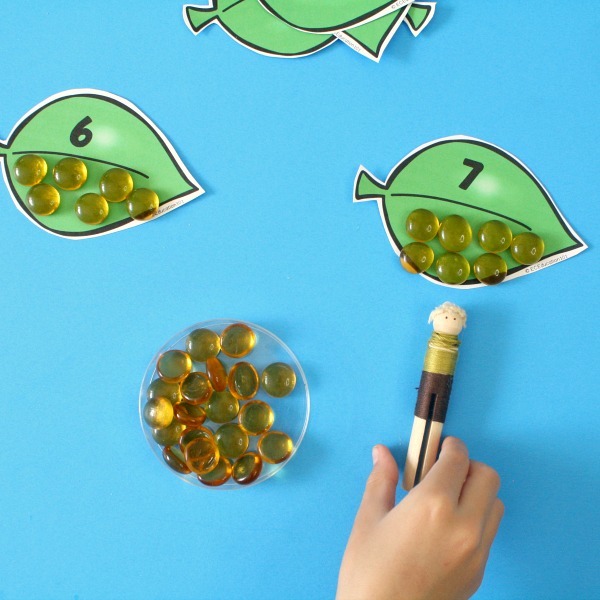 This is a hands-on way to integrate more number sense practice. 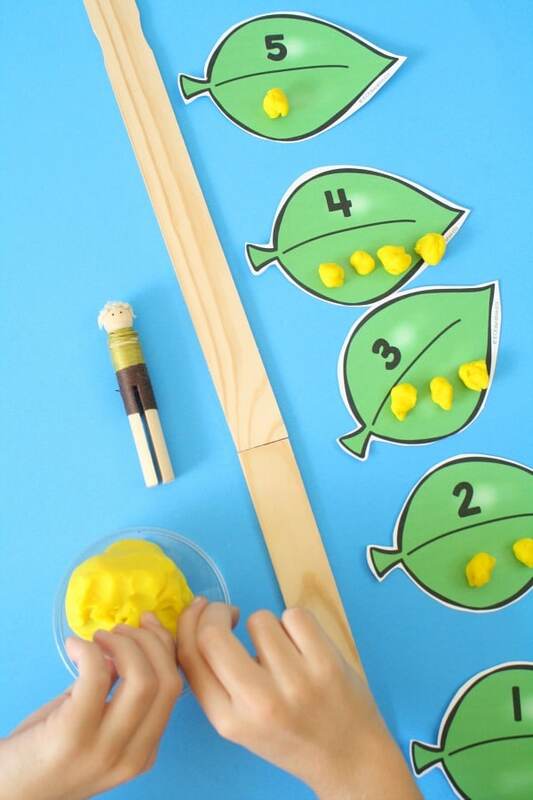 For this next activity you can use the same play dough or you can mix it up a bit and use a different set of manipulatives. Before heading out to buy something new, always check your craft stash. As early childhood educators we’ve got a lot to choose from! 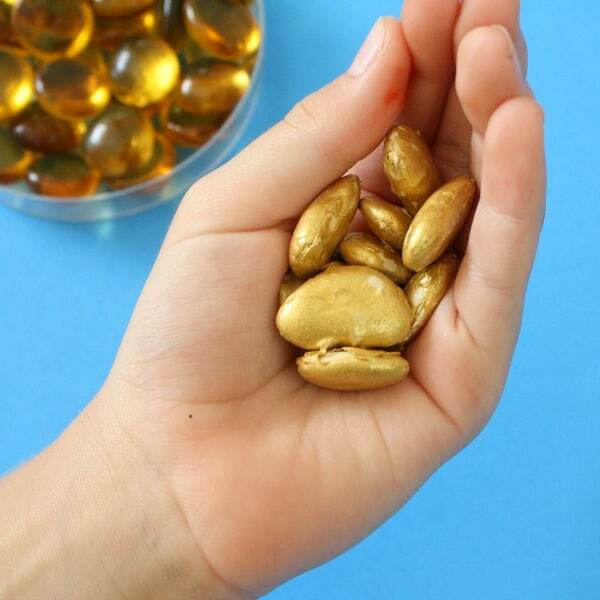 Some options that will work well for this activity are gold glass gems, gold plastic coins, lima beans painted gold, or gold pom poms. 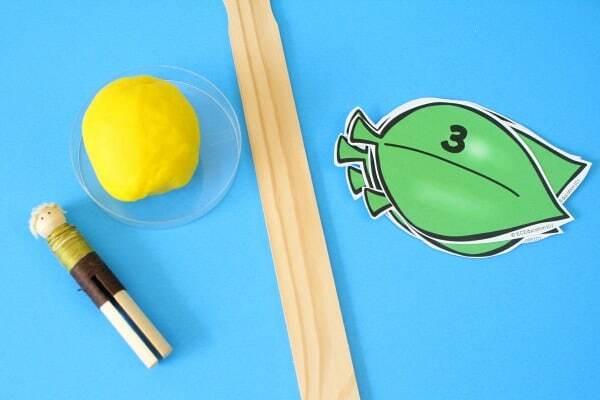 You’ll need essentially the same materials for this activity. This time we’ll start again with the leaves in random order. 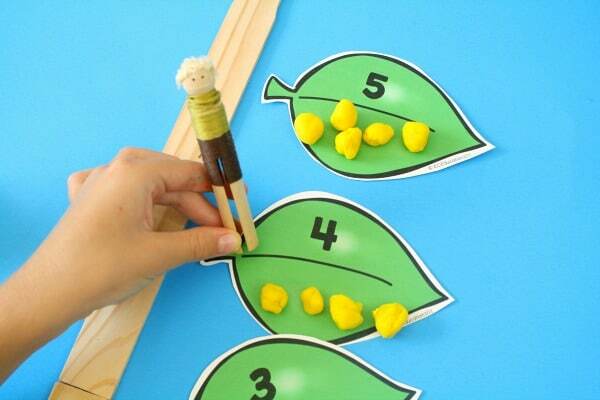 Kids will choose two leaves and place them on opposite sides of Jack. Then they’ll count out sets to match the number on each leaf. When they’re finished they’ll help Jack move to the leaf with the most gold on it. How many more coins are on this leaf than the other leaf? How many fewer coins are on this leaf than the other leaf? How many coins do we need to add/take away to make the leaves have the same amount? 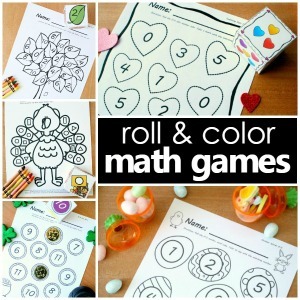 The free printable set includes leaves for numbers 1 to 12. 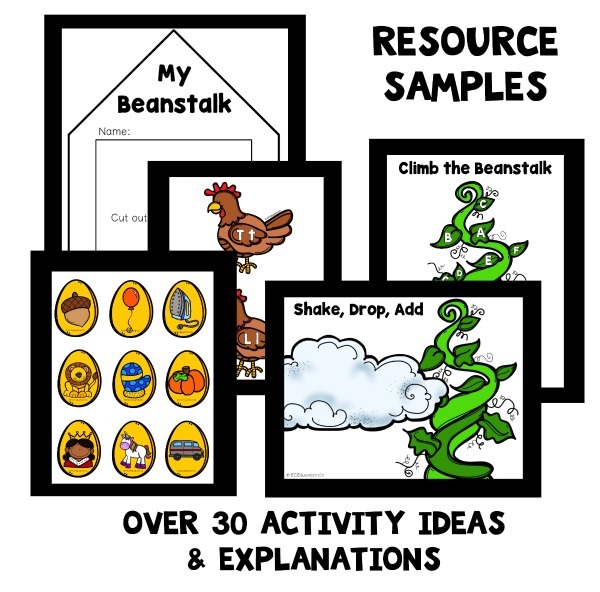 If you’d like to include higher numbers and additional printables related to Jack and the Beanstalk, you’ll want to get the full Jack and the Beanstalk lesson plan set.